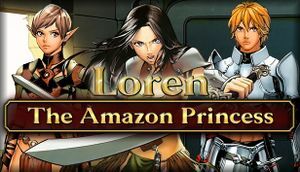 The Steam version of the game contains minor censorship. See Remove Steam censorship for more information. Max native resolution is 1024x576. Music, sound, and voice ("battle"). Nearly all speech is text-only. The only voice acting in the game is during battle; these are not subtitled. 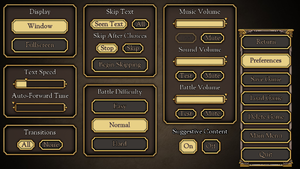 The DRM-free version of the game includes a toggle for "suggestive" content; turning this toggle off gives several characters less-revealing outfits and makes minor changes to images late in the game. The Steam version of the game disables the toggle; however, the developer has provided a workaround to re-enable it. ↑ Steam Community Forums - version 1.3.4 with NEW easy uncensor workaround! This page was last edited on 29 March 2019, at 04:03.